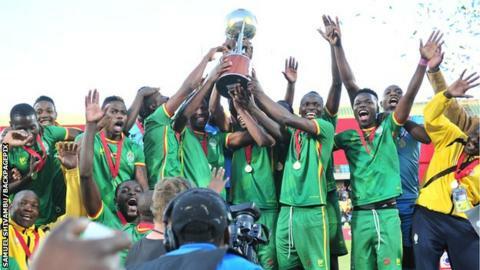 Zimbabwe celebrate their triumph over Zambia as they lift the Cosafa Cup following their 3-1 victory in the final. Zimbabwe overpowered their northern neighbours Zambia 3-1 to win the 2017 Cosafa Castle Cup on Sunday and take a record fifth title. Knox Mutizwa, Talent Chawapiwa and Ocean Mushure all scored in a convincing victory for the Warriors, who took the trophy despite a rigorous schedule that saw them having to play six matches inside a fortnight. They shrugged off the fatigue to get the better of Zambia, who had only come into the tournament halfway through and were playing only their third game. A slip by Zambian goalkeeper Allan Chibwe offered Zimbabwe the opening goal after 18 minutes as Mutizwa managed to out-jump him and score, the ball fortuitously coming off his shoulder. There were several other good chances - two from close-in free kicks - for Zimbabwe to extend their lead but Zambia levelled some six minutes before half-time with the first touch from substitute Lubinda Mundia. He had just come on after Mike Katiba was forced off after a clash of heads and climbed between the Zimbabwe central defenders to head home from a corner. After the break Zimbabwe had been expected to fade because of their tough programme but proved the stronger of the two teams. Zimbabwe's Talent Chawapiwa, named man-of-the-match, was among the scorers in the final against Zambia. Chawapiwa - named man-of-the-match - made all the difference with his runs on the right wing and scored in the 56th minute to restore Zimbabwe's lead. Muitwa's initial effort came back off the upright and Chawapiwa reacted quickly to fire home a powerful shot from inside the penalty area. He then set up Mushure for the third, pulling back his pass after drawing the Zambian defenders and allowing the veteran left-back to hit home in the 67th minute. It proved an early final nail for Zambia who had little to offer in return despite coach Wedson Nyirenda making quick changes to freshen up his side. Zimbabwe captain Ovidy Kararu won the golden boot after scoring six goals during the tournament. Success for Zimbabwe continued the unbeaten record of veteran coach Sunday Chidzambwa in the tournament. He has won it three times now after previous success in 2003 and 2009 and is still yet to lose a match with 13 wins and two draws in 15 games in charge over three different editions. Mutizwa was named player of the tournament while Zimbabwe captain Ovidy Kararu won the golden boot for his six goal contribution.